According to President Trump and the Office of the U.S. Trade Representative (USTR), as of August 27, the United States and Mexico have reached a preliminary agreement in principle, subject to finalization and implementation, to update the 24-year-old North American Free Trade Agreement (NAFTA) with modern provisions representing a 21st century, high-standard agreement. According to the USTR, the updated agreement will support mutually beneficial trade leading to freer markets, fairer trade, and robust economic growth in North America. The California Chamber of Commerce looks forward to learning more details of this agreement, and to a completed trilateral free trade agreement including Canada that allows for certainty for all parties involved and follows the path of Trade Promotion Authority. Intellectual Property: Agreement on a modernized, high-standard Intellectual Property (IP) chapter that provides strong and effective protection and enforcement of IP rights critical to driving innovation, creating economic growth, and supporting American jobs. Digital Trade: Chapter contains the strongest disciplines on digital trade of any international agreement, providing a firm foundation for the expansion of trade and investment in the innovative products and services where the United States has a competitive advantage. De Minimis: To facilitate greater cross-border trade, the United States has reached an agreement for Mexico to raise its de minimis shipment value level to $100 USD, up from $50 USD. Shipment values up to this level would enter Mexico without customs duties or taxes, and with minimal formal entry procedures, making it easier for more businesses, especially small and medium-sized ones, to be a part of cross-border trade. Financial Services: Chapter includes commitments to liberalize financial services markets and facilitate a level playing field for U.S. financial institutions, investors and investments in financial institutions, and cross-border trade in financial services. Labor: Chapter that brings labor obligations into the core of the agreement, makes them fully enforceable, and represents the strongest provisions of any trade agreement. Environment: The most advanced, most comprehensive, highest-standard chapter on the environment of any trade agreement. Like the labor chapter, the environment chapter brings all environmental provisions into the core of agreement and makes them enforceable. Further, the preliminary agreement in principle, which is subject to finalization and implementation, supports North American manufacturing and mutually beneficial trade. According to the USTR, the new agreement will create more balanced, reciprocal trade that supports high-paying jobs for Americans and grows the U.S. and Mexican economies. Rules of Origin and Origin Procedures: Substantive discussions on new rules of origin and origin procedures, including product-specific rules for passenger vehicles, light trucks, and auto parts. This update to the rules of origin will provide greater incentives to source goods and materials in the United States and North America. This deal encourages U.S. manufacturing and regional economic growth by requiring that 75% of auto content be made in the United States and Mexico. This deal uses trade rules to drive higher wages by requiring that 40%–45% of auto content be made by workers earning at least $16 per hour. Goods Market Access: New commitments reflect developments in U.S. trade agreements that address nontariff barriers related to trade in remanufactured goods, import licensing, and export licensing. Textiles:New provisions on textiles incentivize greater U.S. and Mexican production in textiles and apparel trade, strengthen customs enforcement, and facilitate broader consultation and cooperation among the parties on issues related to textiles and apparel trade. Sectoral Annexes: Agreement on new provisions covering trade in specific manufacturing sectors, including information and communication technology, pharmaceuticals, medical devices, cosmetic products, and chemical substances. In addition, per the USTR, the United States and Mexico have reached an agreement to benefit U.S. farmers, ranchers, and agribusinesses. Although agriculture generally has performed well under NAFTA, important improvements in the agreement will enable food and agriculture operations to trade more fairly. Under a modernized agreement, tariffs on agricultural products traded between the United States and Mexico will remain at zero. For the first time, the agreement specifically addresses agricultural biotechnology to support 21st century innovations in agriculture. Building on NAFTA, the United States and Mexico agree to work together in other forums on agriculture matters, to improve transparency and consultations on matters affecting trade between the two countries, and provide for nondiscriminatory treatment in grading of agricultural products. In the Sanitary and Phytosanitary Measures chapter, the United States and Mexico have agreed to strengthen disciplines for science-based sanitary and phytosanitary measures, while ensuring the parties maintain their sovereign right to protect human, animal, and plant life or health. For the first time in NAFTA, the United States and Mexico have agreed to geographical indication standards, labeling and certification provisions that will help the countries avoid barriers to trade in wine and distilled spirits, and proprietary food formulas. The goals of NAFTA are to eliminate trade barriers and facilitate movement of goods and services across borders, promote fair competition, increase investment opportunities, provide protection and enforcement of intellectual property rights, create procedures for trade disputes, and establish a framework for further trilateral, regional and multilateral cooperation to expand the trade agreement’s benefits. U.S. and Mexico negotiators want to agree a deal before the newly elected Mexican president, Andres Manuel Lopez Obrador, takes office on December 1. He has been reluctant to continue Enrique Pena Nieto’s policy of opening up of Mexico’s energy sector, which could complicate negotiations. In order to meet that deadline, the Trump administration must present Congress with a deal at least 90 days in advance according to the Trade Promotion Authority – meaning the deadline is Friday, August 31. It is also hoped Canada may immediately join the negotiations. Since 2017, the California Chamber of Commerce has been communicating with President Trump’s Administration to support the renegotiation of a modernized NAFTA. There were numerous rounds of trilateral negotiations among the US, Canada and Mexico resulting in agreement on a number of chapters. In the last five weeks there have been nonstop negotiations between the US and Mexico. On June 12, 2017 the California Chamber of Commerce submitted comments on “Negotiating Objectives Regarding Modernization of the North American Free Trade Agreement with Canada and Mexico” to the U.S. Trade Representative – with a copy to the California Congressional Delegation. 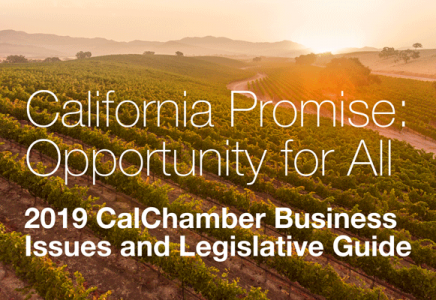 The full text of the CalChamber’s submission can be found here. The new agreement is written to last for 16 years, but would allow the countries involved to revise or modernize aspects of the deal every six years. The pact would continue for another 16 years after it is revised. Originally the CalChamber has opposed the proposed five-year sunset clause, as a forced re-examination of the pact on such a short time frame would cause uncertainty for all parties. The CalChamber understands that the NAFTA was negotiated more than 25 years ago, and, while our economy and businesses have changed considerably over that period, NAFTA has not. We agree with the premise that the United States should seek to support higher-paying jobs in the United States and to grow the U.S. economy by improving U.S. opportunities under NAFTA. The CalChamber actively supported the creation of the NAFTA among the United States, Canada and Mexico, comprising 489.5 million people with combined annual trade with the United States being around $1.139 trillion in 2017. In 2017, goods exports exceeded $525.46 billion while goods imports totaled nearly $614.02 billion. Mexico and Canada are California’s largest and second largest export markets. A successful renegotiation of NAFTA will benefit the California economy and jobs.